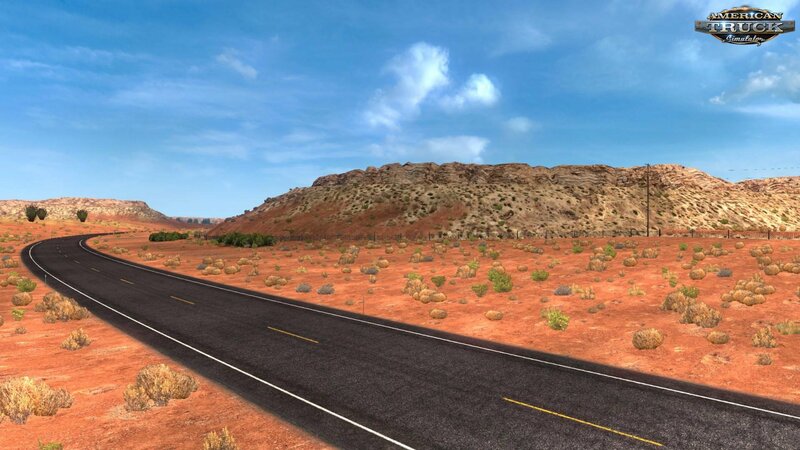 Mod New Mountain Textures v7.7 (1.34.x) for ATS | American Truck Simulator game. 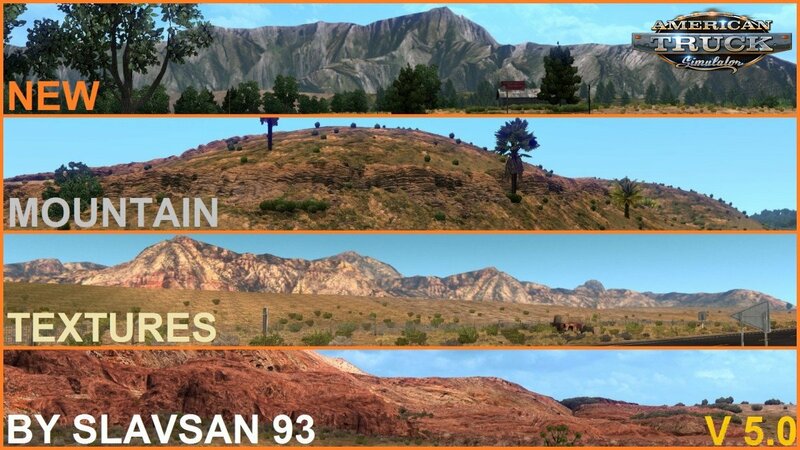 This mod replaces textures for mountains around the map of ATS. and red rocks around the map for a more realistic and diverse look. FYI: the screenshots for this mod have been taken without graphics mods, brightness set on 40% and Color Correction turned off. Alongside with my two other mods: Enhanced Vegetation and Realistic Roads. – Big changes to a lot of textures. Generally, it all looks more realistic now. – A lot of textures are made in such way that it gives an illusion of the landscape being one smooth, merging surface, rather than a bunch of different pieces. 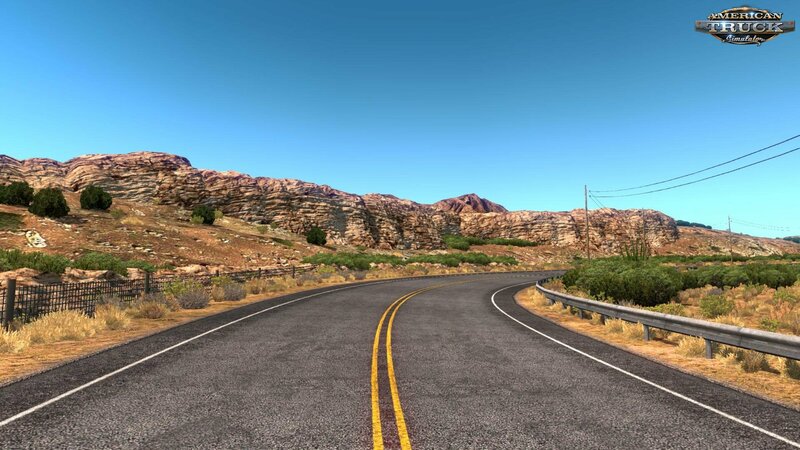 – New better quality texture for cliffs in California and Nevada. 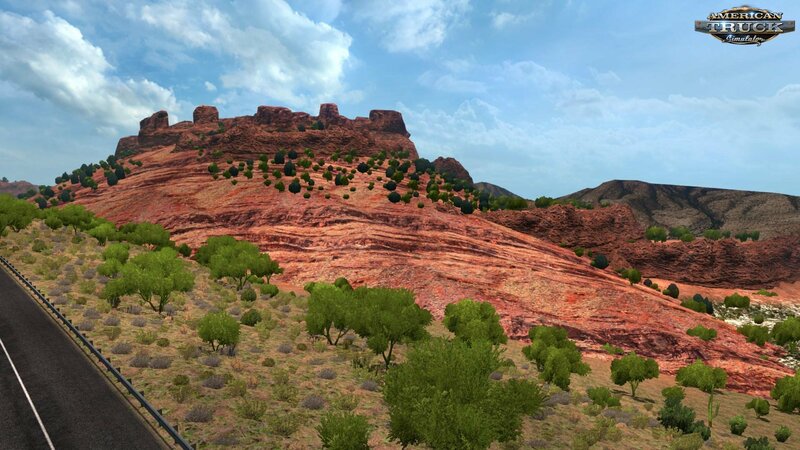 – Completely new textures for red rocks in Arizona. – Several completely new, more realistic and better quality terrain textures. – New textures for mountains that are further from the road (now split into 3 new different kinds of mountains). – A lot of textures are “mixed” with each other for a more diverse and realistic look. – A bunch of other texture improvements. - Some drastic changes to a lot of textures. Generally, it all looks more realistic now. - A lot of textures are selected in such way that it gives an illusion of the landscape being one smooth, merging surface, rather than a bunch of different pieces. - New texture for the Grand Canyon. - Terrain textures have been re-touched. - New textures for mountains that are further from the road. - Terrain textures that are far from the road are replaced with textures based on satellite images.